Photo of the day: Panoramic view of Seoul from Jamdoobong Photo Island on our walk up to N Seoul Tower. 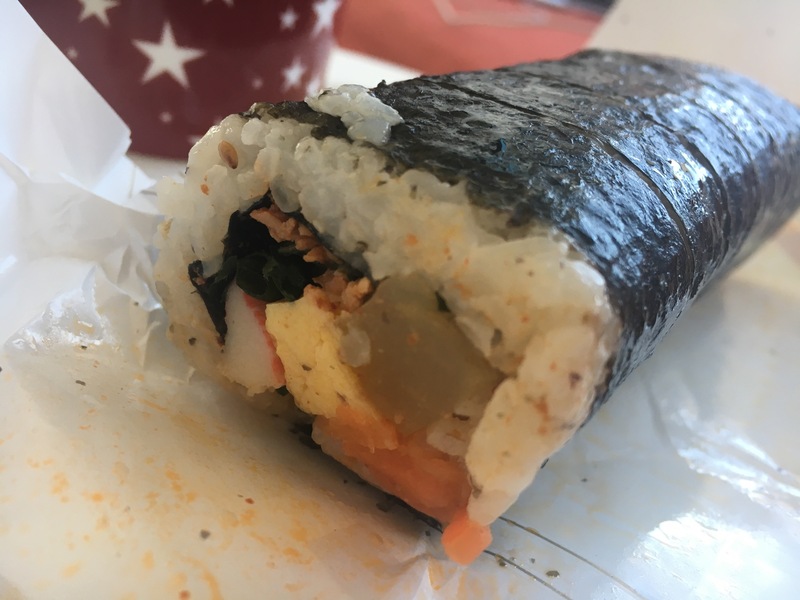 This morning, I had a craving for some Korean convenience store food for breakfast, so before Aaron was even up, I went downstairs to grab a triangular Gimbap and a normal Gimbap and brought it upstairs to eat with Aaron. There were some locals at the store, eating ramyun, which is always a favourite, but I figured I shouldn’t be having that for breakfast. 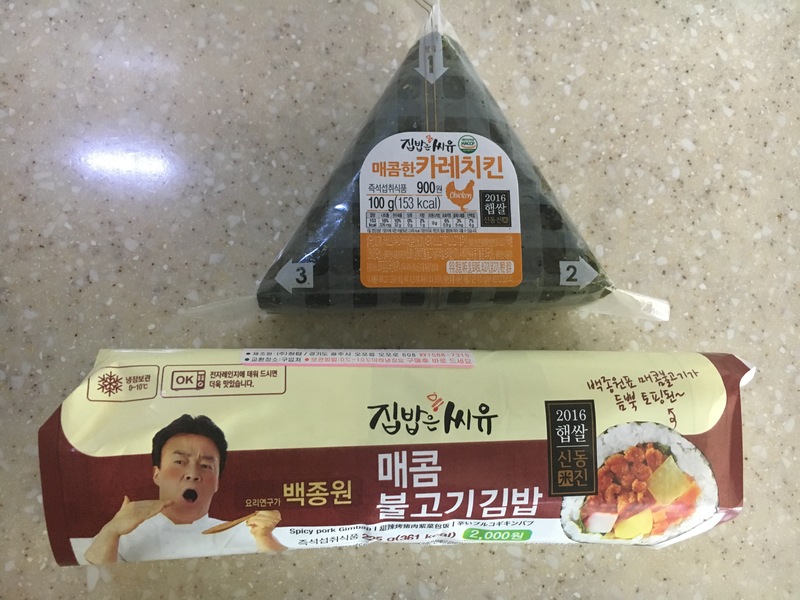 I was very interested in the triangular Gimbap, since I have never had it before. I could not read the wrapping at all and the mystery flavour I got was chicken curry. It was not what I was expecting and it really was mostly full of rice. I enjoyed the regular Gimbap a lot more. This one had English on it and I chose the spicy pork one, which was very tasty and the pickled vegetables inside complemented the nicely marinated pork very well. The inside of the Gimbap. I spent my morning doing research AKA watching YouTube videos and decided it is time that we check out Gwangjang Market. When we arrived, I felt like we were back at Chatuchak Market again. It was so lively and the food stalls were everywhere! Most of the stalls had seats in front of them so it allowed them to sell more than just street food, which you have to carry around with you. I really wanted Bibimbap today since Mina Oh had it here and it looked so good. It was a while before we could find the stalls selling Bibimbap though because there were so many other food stalls to distract us. It was interesting that the food stalls were grouped by category here. 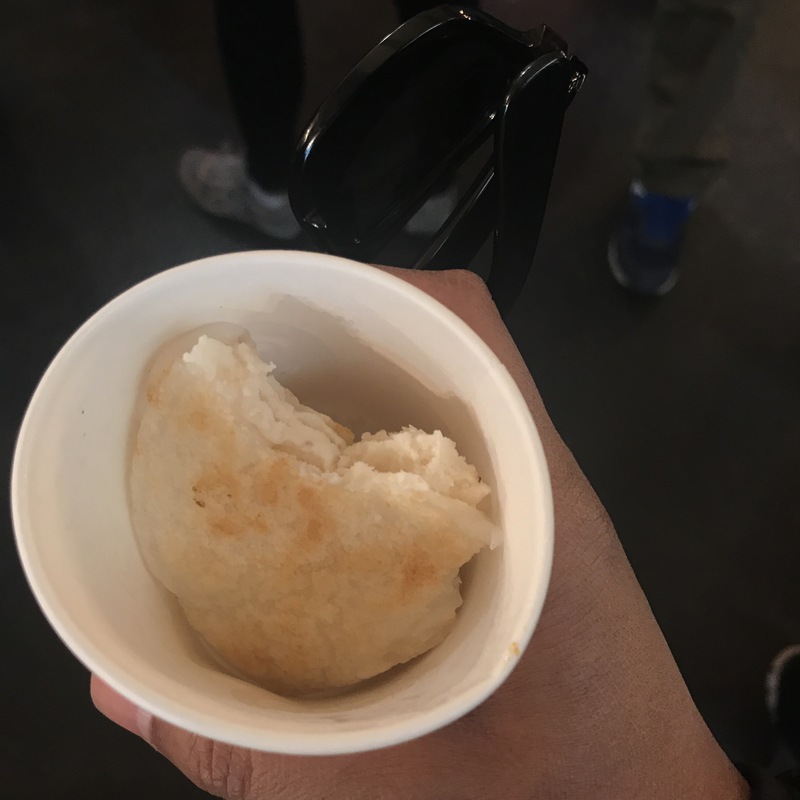 We first encountered a bunch of mung bean pancake stalls, which we wanted but there were no seats. Aaron got this mochi cake thing with some kind of powdering mung bean filling. Sorry, no idea what this was but here is a picture. 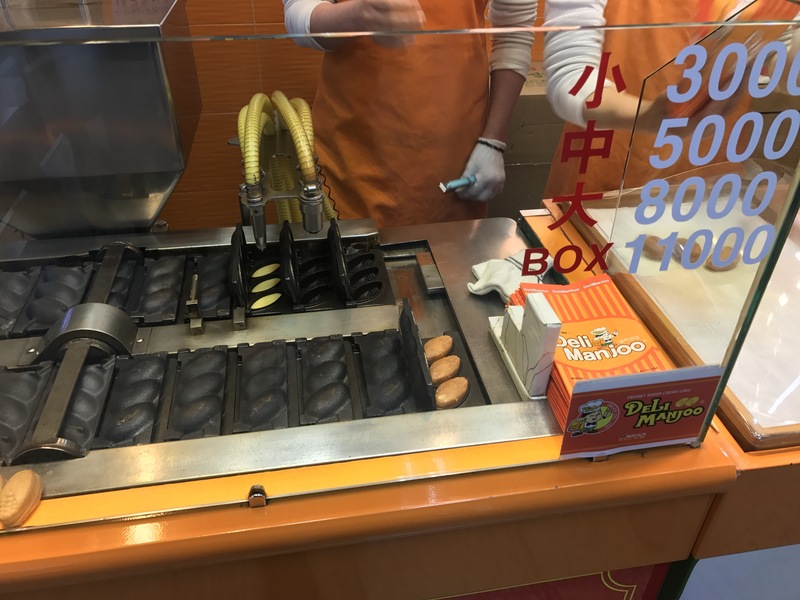 Mystery street food. Does anyone know the name of this? Photo credit: Aaron. I finally found a stall selling Sikhye (sweet rice drink). 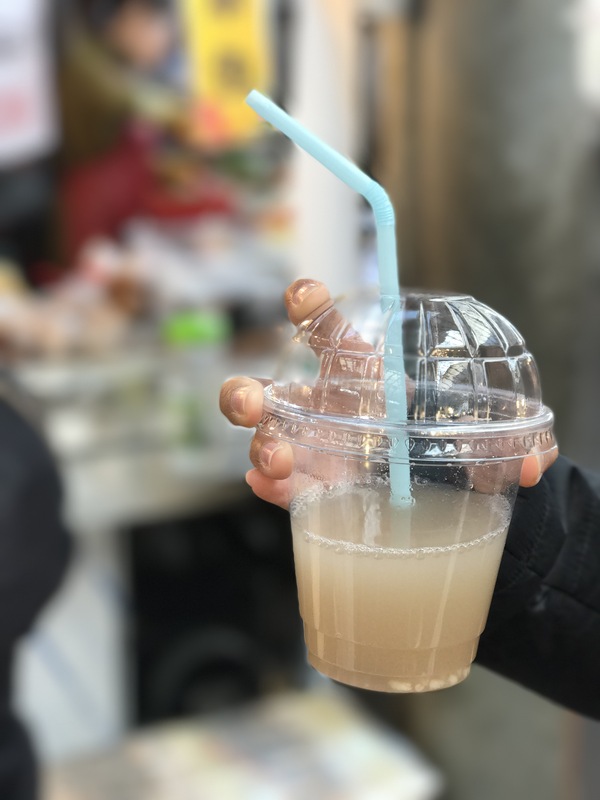 It was very refreshing and would be perfect for a hot summer day, but still tasty for a cold winter day. Sikhye @ Gwangjang Market. Photo credit: Aaron. 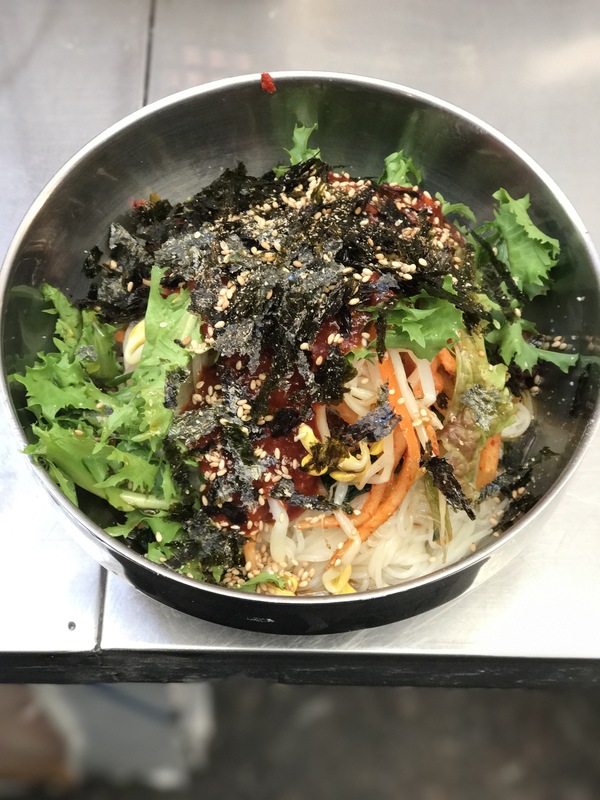 Finally, we found a Bibimbap stall with big bowls of veggies. We quickly sat down the the remaining 2 seats and I ordered one Bibimbap right away. Aaron wanted something different and ordered the spicy noodle. She went over to the big bowls of veggies and started putting stuff into a big bowl for me. She placed it in front of me then put on a disposable plastic glove and gestured if I wanted for her to mix it. I said yes so she mixed it all up for me. I took my first bite and it was spectacular. It was just so favourful and there were so many different textures from the soft rice to the crunch veggies. I was in love. It also came with a nice and hot seaweed soup as well as some kimchi. The lovely lady working at the stall was like a mother. She handed Aaron a spoon so he can share my rice, while waiting for his food. While she was making his, she pointed and said “Massiseoyo!”, which meant it was going to be delicious. I’m glad I am picking up Korean from the YouTube videos I’m watching. Then when his noodles came, she gave me a small plate and asked Aaron to give some to me. The noodles were surprising served cold with similar ingredients as my Bibimbap but with more spice. The portion sizes here were huge and Aaron and I were having problems finishing all the food. Later on in the meal, she asked me in Mandarin whether the food was good and I said yes. It appears that the locals here can speak Chinese more fluently than they can speak English. I’ve heard salespeople speaking fluent Chinese to some customers, whereas their English are broken when they speak to me. On leaving, we overpaid and she was so honest to give us back the extra money we gave her. I really enjoyed my delicious lunch and felt really looked after. We really wanted to try more food here but we were too stuffed, so we headed back on the subway to Myeongdong station. The bibimbap stall we ate at. Look at the mounds of vegetables and Mandoo! 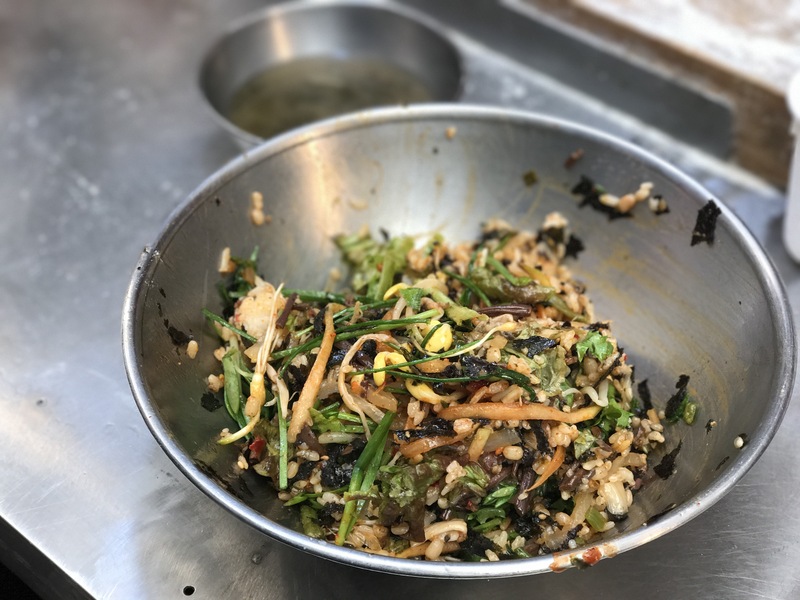 Bibimbap @ Gwangjang Market. Photo credit: Aaron. Spicy noodles – pre-mixing. Photo credit: Aaron. 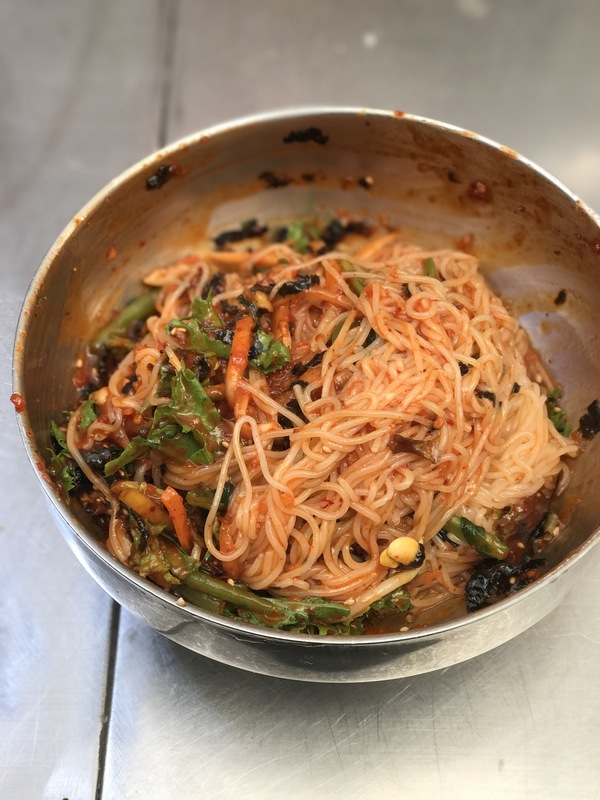 Spicy noodles – post-mixing. Photo credit: Aaron. I was worried about hiking up a mountain during winter time at first but it turns out it was more of a leisurely walk up a fully paved path with no snow on the ground. We couldn’t find good directions for the trail as we did with Doi Suthep but this is what we did. We got out of exit #3 at Myeongdong station, and walked towards the 7-11. 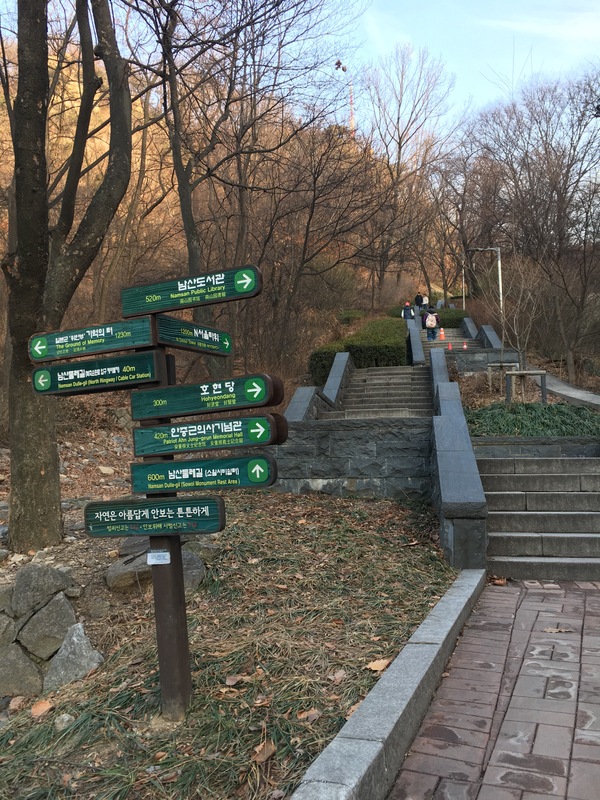 There should be signs pointing towards Namsan Park so we continued in that direction up the hill. We arrived at the cable car lower station and walked across the street and found a trail entrance, which was not the right one. 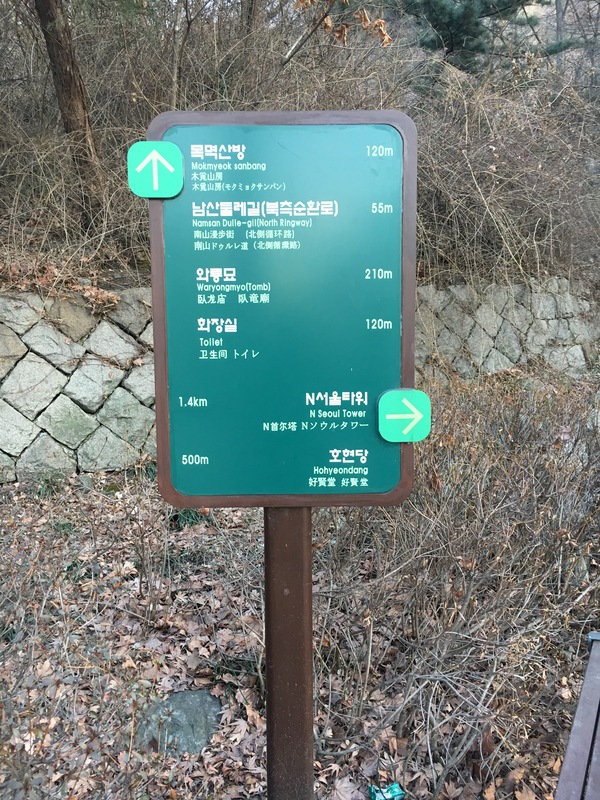 We just followed the signs which pointed to N Seoul Tower! Easy Peasy! We got some of these small custard-filled goodies to warm up before our hike. They were amazing! Photo credit: Aaron. Almost at the lower station for the Namsan Cable Car. Staircase across from cable car station. You would think that is the way up but it’s not. 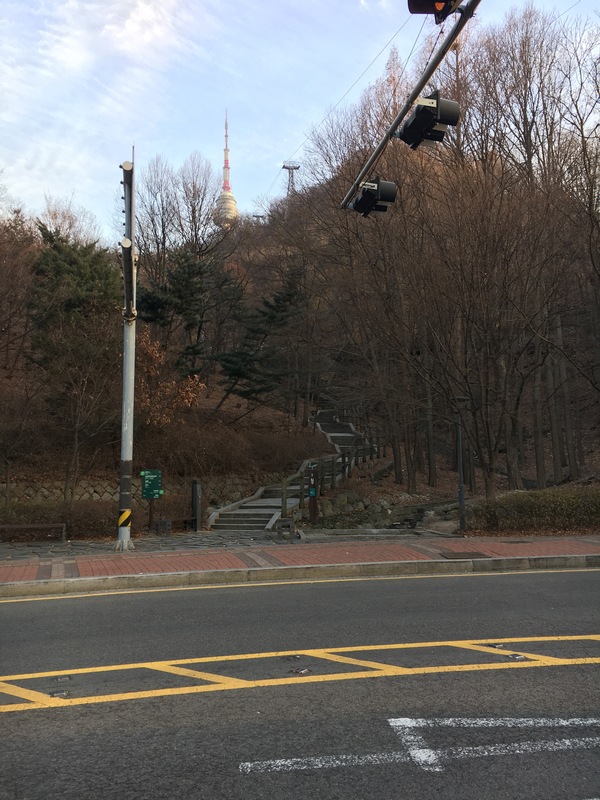 Until you get here – the stairs leading up to the N Seoul Tower. It was a very nice walk with just a few other people doing it a well, ranging from solo elderly ladies, to group of elderly men with their buddies, to young ladies in heels on a date with their partners. Every once in a while, I will turn around to look at the city and the views get more and more amazing as we walked up. I was impressed by the fully equipped outdoor gym and multiple washroom stops available. The thing I appreciated the most was the “photo island”, which was basically a beautiful lookout point allowing you to see panoramic views of the city (see featured image). We went around sunset and it was amazing! It took us only around 30 minutes to reach the top, even with our frequent stops to enjoy the view. Once up there, we joined the crowds to enjoy the views from the observatory. There was also an option to go up the tower for a fee but we figured we got pretty amazing views during our walk and at the observatory already. Another sight here were the hundreds of thousands of locks on the railings everywhere. 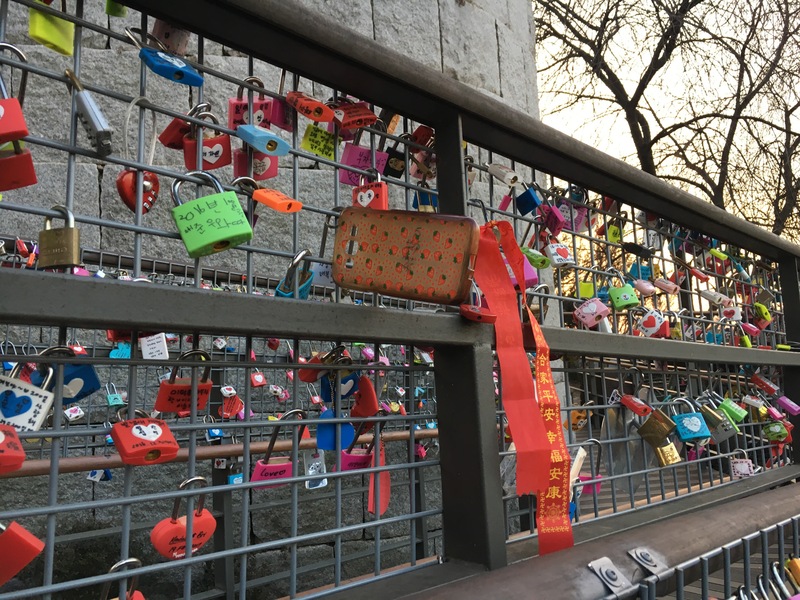 Apparently, there was a scene in a popular Korean soap opera where a couple put up a lock here and now it’s become a huge date spot. Of course, you can buy your lock up there if you’ve forgotten to get one before your journey here. Otherwise, apparently it’s also a thing to hang up your cellphone covers as well. 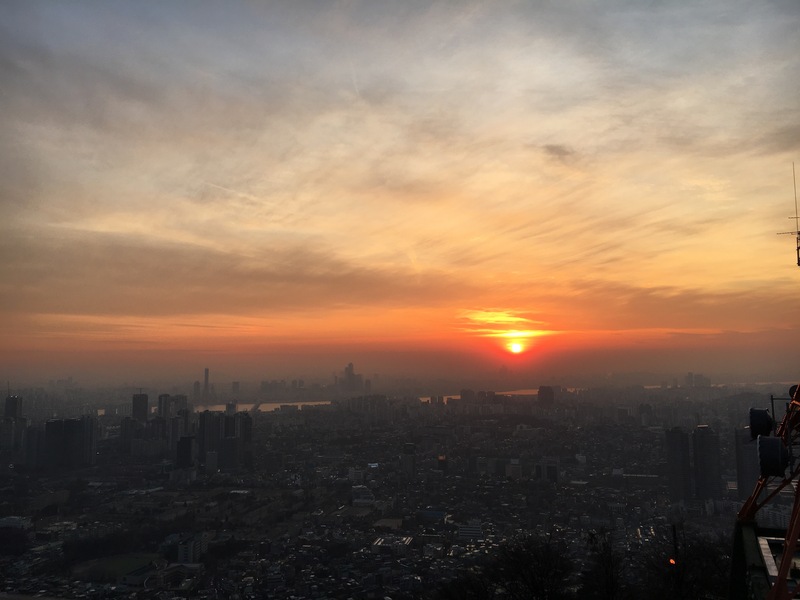 Sunset from base of N Seoul Tower. Cell phone cases is a common find along with locks. We then walked around the 5 floor plaza with sticker picture booths, 3D and 4D experiences, arcade games and more. I got some strawberry earl grey tea latte from GongCha to warm up. I couldn’t really taste the tea. I could only taste the sugary strawberry component. It was like hot strawberry-flavoured milk. There were some places to get food from convenience stores to fancy Italian restaurants with a nice view, but we decided to go down the mountain to find some more local eats. By now, it was dark and we got to enjoy another perspective of Seoul on the way down – the night view. 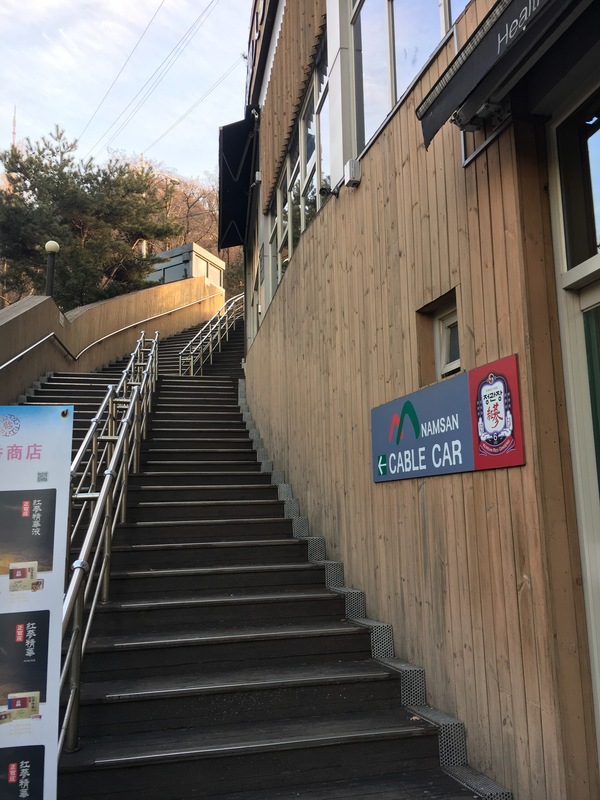 We decided to take the Namsan Ormi Elevator (sideways elevator) just for fun for around 100m from the base of the cable car, bringing us only that much closer to Myeongdong station. Night view of Seoul from Mount Namsan. Photo credit: Aaron. 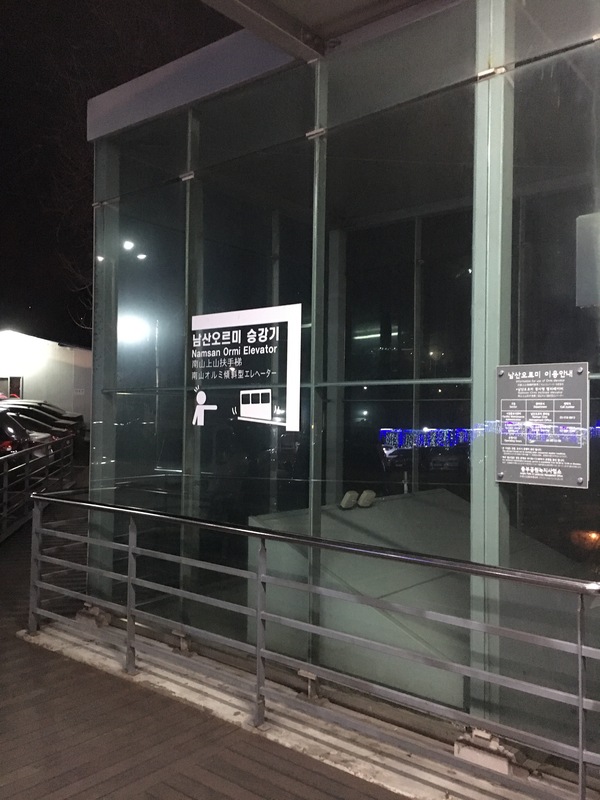 Namsan Ormi Elevator next to lower cable car station. 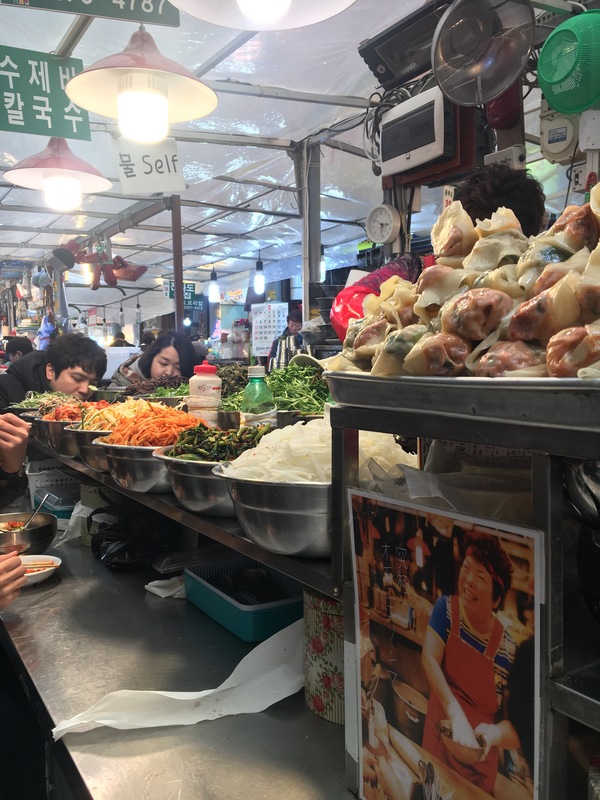 It turns out we ended up at Hoehyeon station, so we decided to try our luck again at Namdaemun market. The market is even more dead at this time of day. Mark Wiens did mention that there were good restaurants on the side alleys of Namdemun, so we decided to look around. 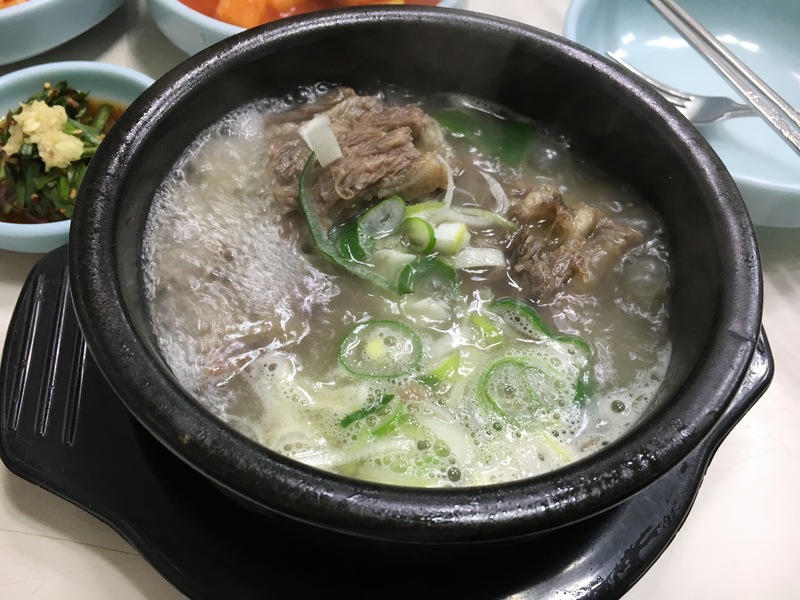 It turns out we found the same restaurant that he went to for some oxtail soup called Jinjujip (watch here), so we walked in. It was apparently famous with posters of it’s several TV appearances plastered on the walls. There was no English menu, so we showed them a picture on the phone. They still seemed confused so I gestured a tail wagging behind me and then they understood. I asked them which one is it on the menu on the wall and they pointed to one of the items with the 尾 (tail) Kanji under it. There were a few items with that character, so I’m glad she understood which one we wanted. The soup was very comforting and the oxtail was pretty tasty. You could add more to the taste by dipping it in the soya sauce/chives mixture before eating. Overall, the food was not bad but we did not think it was worth the 23,000 KRW (~$26 CAD) per serving price tag. It was probably overpriced due to their fame. I really enjoyed our day today. Gwangjang Market is probably my favourite market for food so far. 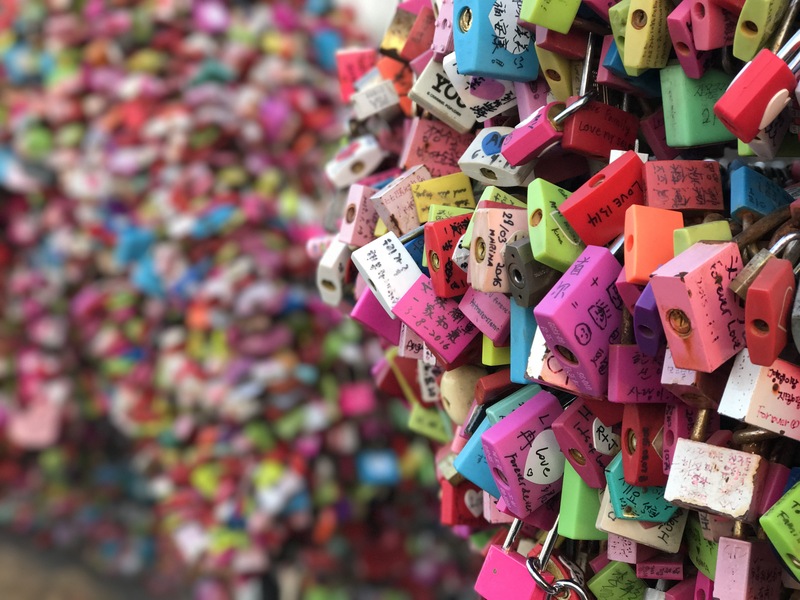 We have not been visiting too many tourist attractions but I would highly recommend the N Seoul Tower for its amazing views and as a romantic date spot.